Reservoir High School had their New Family and Student Orientation for next year's incoming Freshmen last evening, and it was a wonderful program. My daughter, Melody, will be in high school next year, which is hard enough for me to accept, but the fact that she is looking forward to it as much as she is, even with a bit of anxiety, is incredible to me. She's my little girl, and she's going to be a high schooler. Sigh. My wife, Teresa Freed, was an original Reservoir Gator, having been hired away from Ellicott City's Mt. Hebron High School to help open the new school in Fulton, MD, in 2002. She taught Ninth Grade English and Public Speaking, and led the Ninth Grade Team. 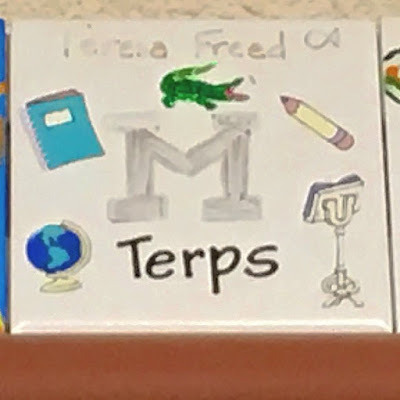 She, like all of the first year staff, also personalized a small tile, and the tiles were hung on walls in the school's Media Center. I had never seen her tile, but since we were at Reservoir last evening, I had the opportunity for the first time to actually see the tile, and it was a wonderful feeling. Teresa and I found ourselves expecting our first child during that first year at Reservoir, and upon the birth or our daughter, Melody, during the Fall of 2003, Teresa took the rest of the year off from teaching. It was April 19, 2004, on a beautiful evening, that we found ourselves walking around with infant Melody at Reservoir High School, hoping to catch up with the principal, Dr. Addie Kaufman, who was working late. That's when Teresa collapsed and died from a massive heart attack, changing our lives forever. While I found myself spending time with the Reservoir family for many years following her death and homegoing, I never really spent much time inside the school. So, last evening, at the Student Orientation, I took the opportunity to go to the Media Center and finally see her tile (pictured at the top of this post). Melody, meanwhile, is getting very excited about high school, and that was the icing on the cake for this proud dad. She is so ready for this. And I'll finish with this: Reservoir High School is an outstanding school, and the sense of community was so apparent and strong last night. I'm so happy that my daughter has this opportunity to attend the same school where her mother taught, and I'm excited for her, too.